HWASEONG, Gyeonggi Province -- Amid fears that the nation’s largest carmaker might be losing momentum, engineers at Hyundai Motor’s research and development center flaunted their creative and innovative ideas for cars of the future in front of executives seeking breakthroughs. Pitching products that ranged from stair-climbing personal mobility devices to air pumps to clear water away from side mirrors, 12 teams of young engineers competed in the annual R&D idea festival, suggesting new possibilities for the carmaker’s future. And for the first time, the contest included engineers from Hyundai China’s R&D unit. “I want to make the best car that fits into China’s market,” said a Chinese engineer who had developed a rear sensor capable of identifying an underground parking space by number. The number, upon being read by the sensor, is sent to the driver’s smartphone so the parked car is easy to find. A group of senior Korean engineers invented a set of wheels and other detachable devices that work together to store electricity and purify the air while driving. The ensemble can be attached to engineless vehicles to make them move, or to two-wheel-drive electric vehicles to increase their motor drive. A car operating without pedals or a steering wheel grabbed visitors’ attention. “For self-driving cars in the future, we thought that we would not need to have a steering wheel,” said a member of the Atlas Team. The developers had left out the steering wheel as well as the pedals. To replace them, they had designed a mouselike controller that sets direction, manages speed and puts on brakes. Another group unveiled an automatic charger that first senses the type of car it is charging, and then releases its arm in just the right position to accurately reach the vehicle’s cap. It can charge up to eight vehicles before automatically recharging itself, the group said. The highlight of the contest was a personal mobility device that climbs stairs and navigates obstacles on roads. The team Namu had crafted it from a Segway hoverboard, equipping it with flexible wheels as well as sensors to detect obstacles. It is the world’s first personal transportation device that climbs stairs, according to the company. Yang was one of the judges who assessed the potential of the ideas. The panel also included Albert Biermann, head of the high-performance car unit of Hyundai Motor Group. 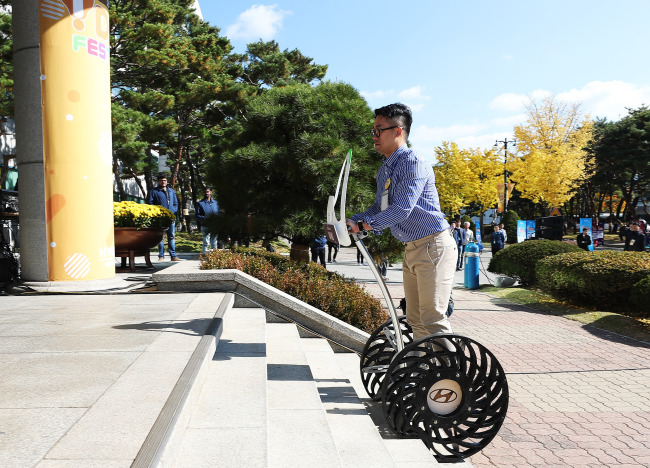 The first prize went to Namu for the personal transportation device capable of climbing stairs.